The Wheels Through Time Museum is home to the world’s premier collection of rare American Vintage Motorcycles. Located 5 miles from the Blue Ridge Parkway, in beautiful Maggie Valley, NC, this All-American motorcycle museum houses over 300 of America’s rarest and most historic classic motorcycles, with over 24 marques on display, including the likes of Harley-Davidson, Indian, Excelsior, Crocker, Henderson, and much more. 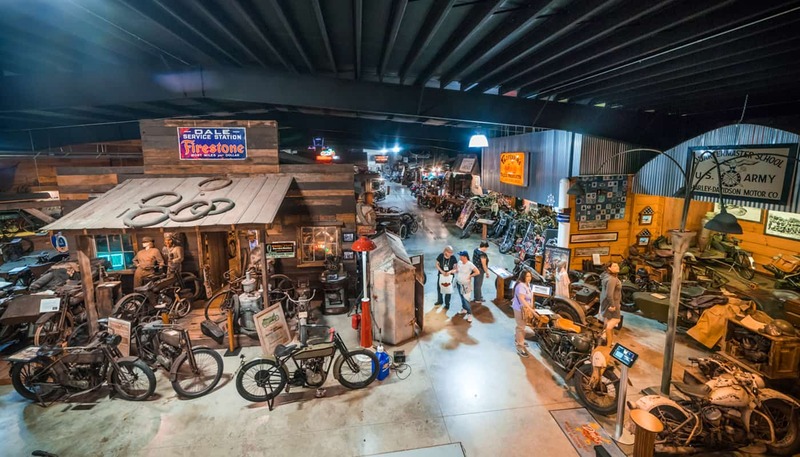 Western North Carolina’s premier museum and tourism attraction features dozens of motorcycle-related exhibits, ranging from board track racers, hillclimbing, and original paint machines to American Dirt Track racing, choppers and bobbers, and one-of-a-kind motorcycles. Perhaps the best part of Wheels Through Time is that almost all of the historic machines on display are kept in running and operating condition. Machines are started and run regularly for visitors, making WTT one of the only places in the world where you can both learn about the history of transportation, as well as hear and see dozens of rare and priceless machines running and riding. Wheels Through Time Museum was featured on American Restoration starting January 2016. For more about the show and episodes visit www.history.ca/american-restoration. Wheels Through Time Museum was also the home-base for Velocity Channel’s hit television series “What’s In the Barn?”. The series began during summer 2013, and catches up with museum founder and curator, Dale Walksler as he criss-crosses the U.S. chasing American motorcycle history that’s been hidden away for decades. Admission covers a one day experience at Wheels Through Time. Admission does include the 7% N.C. sales tax.